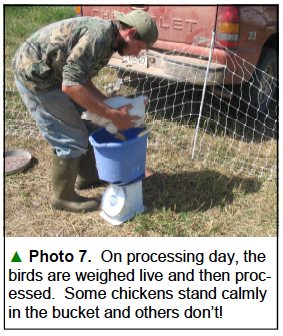 Changing the time when you feed your birds can increase their foraging, potentially increase weight gain, and reduce labor costs. Labor cost and feed-conversion efficiencies; these are the two things that determine the profitability of a pastured meat-bird operation. The less you have to work with the birds, the lower your labor costs. 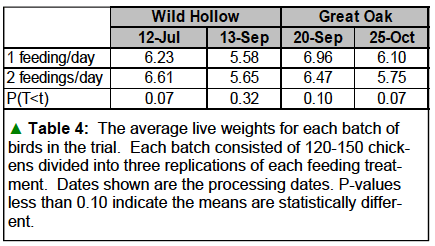 But how do you improve the rate that they turn feed into meat? That’s the question that the producers at Pasture Perfect Poultry decided to answer with some on farm research supported by SARE (Sustainable Agriculture Research and Education.) It turns out that by paying attention to WHEN you feed the birds, you reduce your labor costs and you increase their feed efficiency. After watching the birds in the Day Range system, they learned that birds foraged most actively during the early morning and the evening hours. That also happened to be the time when they fed they chicks and let them out to forage, or when they put them up in the evening. But what if they fed them once a day between 11 am and 2 pm? Would that take advantage of their natural behavior and improve weight gain? 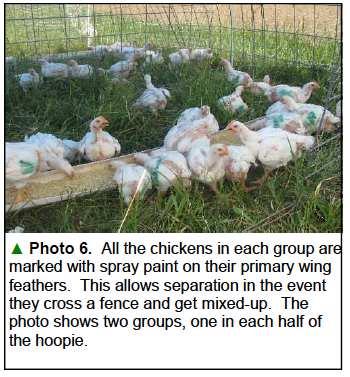 If it did, this kind of system would also reduce labor costs by requiring only one visit to the chickens each day. Melissa encourages others to do this trial on their operations. She notes that very little research is being done in this field, and that additional data gathered by farmers will help everyone figure out how to maximize profits and gain. If you’d like to run your own trial, she and her colleagues created a “how-to” manual that you can download here. You can share your results by contacting Melissa and Jason Fischbach at pastureperfectpoultry(at)gmail.com.